This month we swing a shoe, meet the artist exploring the layers and fragmentation of the Bletchley Park story and hear from a Foreign Office clerk who thought she was going to be a spy. 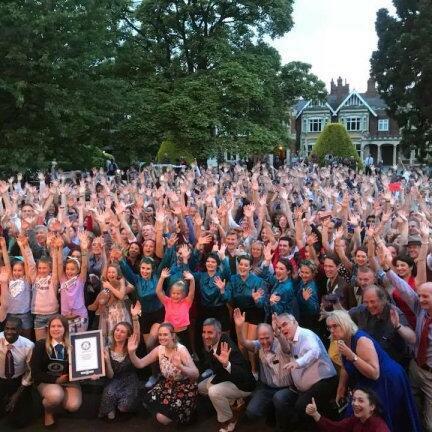 Hear what happened when Bletchley Park played host to a Guinness World Record attempt at the largest swing dance lesson. The swing dance club, JiveSwing, led the couples, many of whom who’d turned out in their best vintage gear, in a half hour lesson followed by a three minute dance, to take a crack at the record. Mary Kenyon had visions of being a sultry secret agent when she was called up to a mysterious sounding job at the Foreign Office in 1943. But she was sent to Bletchley Park where she collected and collated messages, working alongside the luminary codebreaker Asa Briggs. Mary recalled her vital war work in Hut 6 when she told her story to Bletchley Park’s Oral History Project in 2014. Also in this episode, we meet Sally Annett, an artist whose vision is brought to life in a new exhibition in Block B. She explores the themes of fragmentation and layers - as they apply to the way the Government Code and Cipher School was organised, and makes a nod to the people whose contribution is not recorded in the Roll of Honour, because neither they nor their families have put their names forward. Listen and swing along to all the above, in this month’s episode.